In this 1657 painting, Rembrandt pictures St. Paul praying and writing. Rembrandt (and Workshop? ), "Apostle Paul" (1657), Oil on canvas, National Gallery of Art, Washington, DC, 40.9" x 51.6". Larger image. 14For this reason I kneel before the Father, 15from whom his whole family in heaven and on earth derives its name. 16I pray that out of his glorious riches he may strengthen you with power through his Spirit in your inner being, 17so that Christ may dwell in your hearts through faith. And I pray that you, being rooted and established in love, 18may have power, together with all the saints, to grasp how wide and long and high and deep is the love of Christ, 19and to know this love that surpasses knowledge--that you may be filled to the measure of all the fullness of God. Paul offers two intercessory prayers for the Ephesian believers in this amazing letter, though he was accustomed to ask God for extravagant blessings in other letters (Philippians 1:9; 4:19; Colossians 1:9-14; 1 Thessalonians 3:12; 2 Thessalonians 1:3; cf. 1 Corinthians 1:5). As you read Ephesians, he seems like he goes from prayer to praise and back again. He begins a prayer in chapter 1, then leaves it in praise of Christ. He concludes the prayer at the end of chapter 3 and caps it off with a wonderful doxology. As I was trying to prepare a list of the great prayers of the Bible, first one then the other of these prayers was on the list, so I've decided to include them both in a two-part lesson. These prayers are a bit intimidating. Paul uses such enthusiastic theological and spiritual language, you're almost overwhelmed. We can't pray like that ourselves -- except by imitation of the Apostle's prayer. But his marvelous prayer teaches us how we are to pray for one another. No puny sentence prayer, but a grand, visionary, far reaching prayer for our brothers and sisters that begins in their spirit and ends at the right hand of Christ and with the glory of God. Dear friends, we need -- I need -- to pray appropriate, thoughtful, meaningful prayers for other Christians. These prayers of Paul help me do that and I trust they'll help you, too. These prayers are complex and glorious in their descriptive detail. But because of the abundance of detail, it's hard to see the forest for the trees. So before we consider these prayers in detail, let's step back and look at the big picture. I've created a bare-bones outline of Paul's prayers -- four petitions, four purposes and a doxology (at least that's one way to understand it). I realize that there are other ways to understand these prayers -- and Paul certainly isn't laying out a logical sequence -- he's praying his heart out.1But this will help you get a gist of it. This tells you where Paul is going in his prayer. Notice that he prays for insight, inner strength, and love for the believers, for the purpose that they will comprehend/understand truth, know God better, and be filled to overflowing with God. Paul is praying that they will finally "get it!" -- have a breakthrough in their comprehension and understanding of what it's all about. Paul prays that their lives will be filled with God -- which is another way to say "know him" and have "Christ dwell in your hearts." Continual. "I have not stopped" indicates that Paul's prayer wasn't just once or twice, but a continued prayer for them day after day.2How sporadic we are sometimes in our prayers for fellow believers! Thankful. Paul doesn't cease giving thanks to God for the believers. The verb is eucharisteō (from which we get our word "Eucharist"), "to express appreciation for benefits or blessings, give thanks, express thanks, render/return thanks. "3Do we give thanks for people in prayer, or just take them for granted? Mindful. Paul doesn't just pray general prayers but specific prayers for the Ephesians. The phrase translated "remembering" (NIV, cf. NRSV) or "making mention" (KJV), uses the noun mneia, which can be translated either as "remembrance, memory" (2 Timothy 1:3) or "mention." Here, probably the idea of mention in prayer and remembrance in prayer are both in view.4A number of times in his letters Paul combines these words -- being thankful and remembering in prayer (Philippians 1:3; 1 Thessalonians 1:2; Philemon 1:4; Romans 1:9). How do we remember others? Having a list can help remind us, unless we have superbly trained memories. Who is on your prayer list? Do you remember them continually with thanksgiving to God? Now Paul prays that a special revelation will come to them. He prays that God will take off the blinders, expand their minds, and help them to understand the hugeness of the faith. "The God of our Lord Jesus Christ." This doesn't detract from Paul's teaching about the divinity of Christ. Paul is just making the point that he prays to the God that Jesus himself revealed to us. "The glorious Father" (NIV) or "the Father of glory" (KJV, NRSV). Elsewhere God is referred to as "the King of glory" (Psalm 24:7, 10) and "the God of glory" (Psalm 29:3; Acts 7:2). Jesus himself is called "the Lord of glory" (1 Corinthians 2:8). What does this phrase signify? That the Father is full of and surrounded with glory. I think of God revealing himself to Moses on Mt. Sinai in fire and smoke. The Shekinah glory of God is great, inexpressible light. Paul prays to "the Father of glory." Just how do you cause a person to get to know God better? Teaching? Yes, that can help some. But for a person to "get it" takes the Holy Spirit's work. That is why the "work" of ministry is really prayer. That is why in this prison epistle of Ephesians, Paul is able to "work" in jail, and see his prayers answered in human lives opened to God. Q1. (1:17-18). What do you learn from Paul's manner of prayer for the Ephesian believers? If Christians stopped praying for people to receive a revelation of God, would people come to know God on their own? Would God work in them at all? How important is this kind of prayer? As Paul prays, I see a big, three-dimensional Valentine with eyes (and maybe eyelashes, I don't know). The big eyes on this red heart are closed. Not closed tightly, but closed. "I pray," Paul says, "that the eyes of your heart may be enlightened.�" One eye begins to open a little, and then another. The big Valentine winces a bit as it gets adjusted to the light that is now starting to come in through squinted eyes. Wow, I can see things out there that I didn't even know existed. The other eye opens as Paul prays for specific aspect of revelation. The heart with closed eyes has now become an excited heart, beating wildly with joy and anticipation as it begins to see new things, and understand new truths. "I pray that the eyes of your heart may be enlightened." First, Paul prays that they "may know the hope to which he has called you." "Hope" (Greek elpis) is "the looking forward to something with some reason for confidence respecting fulfillment, hope, expectation. "10Eager watchfulness. We can become bored, lazy, hopeless, listless. Jesus Christ is the hope of glory for us (Colossians 1:27). Jesus Christ's return is our "blessed hope" (Titus 2:13). I have been meditating on the close relationship of faith, hope, and joy. Faith is "trust." Hope refers to a faith in what will happen in the future, "expectation." Joy is the direct result of faith and hope. Have you ever met a person without any hope or expectation? How sad. They are ready to die, want to die. They are apt to die by their own hand, even. Because they have nothing to look forward to, thus no joy, no faith in a future that God will bring. God's people need hope, too. Some Christians have been caricatured as "so heavenly minded that they are no earthly good." Maybe so. But many Christians in our generation have not been taught about the promises of Christ's coming, of the Reign of God throughout the earth, of the blessings of heaven, of finally seeing his face (Revelation 22:4). Many Christians have been taught to live in the here and now, but with no real expectation that God will answer prayer and intervene in miraculous ways. They are without hope. In Paul's prayer he asserts that we are "called" to hope -- summoned to it by God. He intercedes for the Ephesian believers that theirs will be an active faith, expecting answers to their prayers and ultimately to expect Christ to come. We have been called to a future and a hope, to look forward, to anticipate, even to hasten Christ's coming in power and in glory (2 Peter 3:12). Paul prays for our hope to expand and embrace a big future, rather than shrivel in pain, bitterness, and discouragement or die in a parched desert of spiritual starvation. He prays that we might comprehend the hope of the future we have in Jesus Christ to we have been called as brothers and sisters. Q2. (1:18) How has your Christian "hope" changed your way of living? What is the result of Christians with only a meager or minute hope? How would you pray for hope to be borne in others? Second, Paul prays that we might know "the riches of his glorious inheritance(klēronomia)11in the saints." What is an inheritance? The carefully accumulated possessions of another, set aside and preserved to pass on to one's heirs. Our is a "glorious inheritance," Paul says. An inheritance which is attended by glory, which consists of glory in his presence, which is rich beyond all comparison. Moreover we are to see the riches (Greek ploutos, "wealth, abundance, plentiful supply"12) of his inheritance. It is not meager but abundant, overflowing, beyond counting. We sometimes live lives of struggle and hurt, of love and of reaching out, but we fall so short. Paul prays that we will be able to comprehend that we have ahead of us a reward above all measure. A precious redemption purchased at great cost by our Brother, Jesus Christ. Someone described GRACE as an acronym -- "God's Riches At Christ's Expense." An inheritance. But more than that, it is an inheritance "in the saints." Ours is not a solo award, but one we will share forever and ever with all God's people, living and dead. Oh, don't worry, there's plenty for all. But it is shared with the family. Sometimes we are tempted to isolate ourselves from others. We've suffered too much rejection, we tell ourselves. We have some painful "history" that makes us love-shy and so we practice our own form of hermit-Christianity. But our inheritance is "in the saints," part of a corporate body. This truth is a portion of the revelation here of the nature of this inheritance. Q3. (1:18) What is the result in prayer and faith if believers think that God is poverty-stricken? How does knowledge of a "glorious inheritance" motivate our lives? Our prayers? How can you pray for others to glimpse this inheritance? First, hope. Second, inheritance. Third, Paul prays that we might know "his incomparably great power for (Greek eis) us who believe." The Greek word eis often carries a sense of motion, "into, in, toward, to" and sometimes is a marker of goals.13The use here could carry the idea of power directed "into us," "toward us," or "for our benefit." While it's difficult to say which it is precisely, the idea is still wonderful! In this case, God's immeasurable power is into and unto us believers. It is "incomparably great" -- a pair of Greek words. Huperballō means "to attain a degree that extraordinarily exceeds a point on a scale of extent, go beyond, surpass, outdo. "14The second word in this pair is megethos, "greatness, a quality of exceeding a standard of excellence. "15Paul heaps one word upon another to impress upon us the extreme, humongous, immeasurable nature of the power. God's full horsepower at our disposal, working in us who believe. And because this Counselor, the Holy Spirit, now lives inside of us, with us at the very deepest level, we will do greater things than even Jesus' miracles (John 14:12). You see, the very same power that empowered Jesus' ministry on earth dwells in us. The very same power that called Lazarus to come out of the tomb lives in you in the presence of the Third Person of the Trinity. The power in the hands that touched blind eyes and made them see, that broke bread and fishes and fed 5,000 is in you. But I don't see anything of the kind, you say. I feel powerless. Perhaps. All the more reason that you need God to reveal this truth to you -- "his incomparably great power for us who believe." Paul goes on to describe the kind of power he means -- "like (Greek kata, "in accordance with, just as, similar to"17) as his mighty strength which he (God) exerted in Christ when he raised him from the dead." Wow! Paul prays that we might experience the same magnitude of power that God exercised in the resurrection of Christ from the dead! Q4. (1:18) Why is a revelation of "his incomparably great power for us who believe" essential to a vital faith? How do you develop this faith in yourself? How do you pray for it for others? I don't see it, you contend. Exactly. That is why Paul is praying diligently that the eyeballs of your heart may be opened, that your blindness be cured, that your faith be broadened. And mine too. We live so far below our hope, our inheritance, our power. "'No eye has seen, no ear has heard, no mind has conceived what God has prepared for those who love him' -- but God has revealed it to us by his Spirit" (1 Corinthians 2:9-10). It has been my observation that some churches tend to grow Christians who believe in the God of the impossible, who are ready to pray with faith at a moment's notice. Other churches raise Christians with a much more intellectual, distant faith. They tend to doubt that God might intervene today, though they might acknowledge that he once intervened in history in Christ. Some churches are hot-houses that multiply faith, others are like root cellars designed to keep vegetables cool enough that they don't spoil, but warm enough that they don't freeze. Which is yours? Prayer is not a thermometer to measure the level of faith, but a thermostat to increase the level of faith to its desired level. Whether you are a leader or a follower in your church, your prayers can help heat up the level of faith, expectation, and power-anticipation in your congregation. In fact, without your prayers the level of faith will be only mediocre. Faith will be only be luke-warm. Dear friends, I want to learn how to pray like Paul, with a vision that sees what believers will be like when they are infused with hope, excited about their inheritance, and pregnant with power eager to be used on God's behalf. Teach me to pray, Lord. Teach me to live! We have looked now at the first two petitions in Paul's two-part prayer for the Ephesians. By way of review, here's our simplified chart of Paul's petitions. "14For this reason I kneel before the Father, 15from whom his whole family in heaven and on earth derives its name. 16I pray that out of his glorious riches he may strengthen you with power through his Spirit in your inner being, 17so that Christ may dwell in your hearts through faith. And I pray that you, being rooted and established in love, 18may have power, together with all the saints, to grasp how wide and long and high and deep is the love of Christ, 19and to know this love that surpasses knowledge--that you may be filled to the measure of all the fullness of God. Notice, Paul's prayer posture here -- kneeling (also Acts 20:36; 21:5) -- probably a posture of special earnestness. He definitely had a large view of God's "glorious riches." This phrase "inner being" (NIV, NRSV) or "inner man" (KJV) is made up of two words: anthropos, the generic noun for man, mankind, humankind, with no reflection of male gender, and the adverb of place esō, "inside, within. "25See similar expressions in Romans 7:22 and 2 Corinthians 4:16, and the idea expressed in Jeremiah 31:33; Romans 2:29; and 1 Peter 3:4. In verse 16 Paul prays that the Ephesian believers may be strengthened in the inner being. In verse 17a he says this another way, using the word "hearts" as a synonym of this "inner being." So what is Paul praying here for the Ephesian believers? The Spirit's inner strengthening is the same thing as Christ dwelling in their hearts; these are two ways to express the same truth.29He is praying that they might be strong in the Holy Spirit, that the Messiah in all his might and strength might fully empower them. The purpose statement (if there really is one with this petition) may be found in 3:19b. Q5 (3:16-17) Why does Paul pray for strengthening of the inner man? How would we pray this prayer today? Why does he pray that Christ dwell in the believers' hearts? Isn't this already an established fact? When I was in college, I worked hard to understand calculus. As a chemistry major I needed it, but despite my efforts, my grades in calculus over three quarters were C, C-minus, C-minus. I passed -- barely -- but I just didn't "get it." I couldn't wrap my mind around it for some reason. I ended up changing to a major in biology instead. Love can be like that, too. Love is the basic thing, but so easily we miss it. We go on acting in our old selfish manner oblivious to the new life of Christ inside of us. Paul prays that the Ephesian believers will be able to shift into hyperdrive (as StarWars would put it). To grasp that love isn't just the foundation, but also the whole thing -- "how wide and long and high and deep." Paul doesn't want their love to stop with mere dimensions; he prays a paradox -- that they may "know the unknowable," literally "to know the love of Christ that surpasses knowledge" (NRSV). He employs the verb huperballō that we saw in Paul's prayer in 1:19, which means, "to attain a degree that extraordinarily exceeds a point on a scale of extent, go beyond, surpass, outdo. "33In other words, Paul is praying that they might know Christ's love to the nth degree. Is he praying that they are able to understand Christ's love for them or that they themselves would be able to love others? Both probably. Grammatically, the term "love of Christ" can be taken as either subjective genitive or objective genitive. But no doubt it begins with understanding Christ's love for us and grows from there. Q6. (3:17-19) Why does Paul pray that the believers grasp the fullest extent of Christ's love for them? How does comprehending this love change a person's spiritual life? Is there any end to Christ's love for a person? Paul has been dealing with superlatives when he talks about knowing that which surpasses knowledge. And he has prayed for the inner person, for Christ to dwell in the heart (3:16-17). Now he prays what might be the purpose or the end of those petitions. The fullness (plērōma) of God is an important theme in Paul's letters. 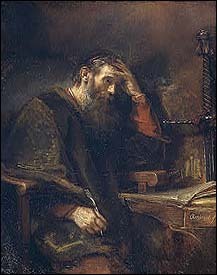 Though the term was used in Gnostic literature, it is much more likely that the roots of Paul's understanding of the word draw from Old Testament sources, where, according to Barth, it "equates with concepts of the shekina (glorious presence), spirit or wisdom of God.... God fills his house or the earth with his presence, so that his 'fullness' resides at the chosen place and manifests itself with power...." The term plērōma "must mean the act by which God makes his power and presence felt." In verse 19, Barth renders the phrase, "Filled with all the fullness of God," as "May you become so perfect as to attain to the full perfection of God. "36Yes indeed, it is an amazingly bold prayer for the Ephesian believers -- a prayer I want to learn to pray for the people in my church and for the Church Universal. Q7. (3:19) Have you ever prayed for a fellow believer that he or she might be "filled with all the fullness of God"? What would you be praying for with that kind of prayer? How does this prayer relate to Ephesians 5:27 and Colossians 1:28? Notice that the limiting factor is not what we can ask or imagine. The limiting factor is the power (dunamis) that is working (energeō) in us. Whose power? God's power! Remember in the first prayer the eyes of our hearts were opened to "his incomparably great power," which was central to Paul's prayer in 1:19. There is no limit to God's power. Paul has been praying -- and instructing us in prayer. He is brimming to the top and running over with an awareness of the limitless power of God at work in us. And we worry about asking things of God that are too big. Shame on us! Our ability to "ask or imagine" may be limited, but not God's power. God can and does work beyond our ability to ask. When you go in for an operation, you don't need to understand all the technology that will be used by the surgeon and the surgeon's team. You just have to believe they can get the job done and ask for the operation. It's their job to know more than you. Q8. (3:20) How should verse 3:20 of the doxology energize your prayers? What happens when we limit God by our own ability to comprehend? How can we get past this failing? "Unto Him be glory in the church, both now and evermore. Unto Him be glory in the church, both now and evermore. Unto Him, unto Him, unto Him, unto Him. There are two ways to understand Paul's phrase, "glory in the church," depending on how you translate the Greek preposition en, either as instrumental or locative.42If you take it as instrumental, "by means of," the question is: How is the church to bring glory to him? By the way we live and love. By the way we preach the greatness of Christ. By our obedience. And most of all, perhaps, by our praise. But you could also understand this phrase in a locative sense: "To him be glory in (the midst of, among) the church," where en means "in, on, at, within, among. "43I'm not talking about the church (the ekklēsia) as a church building, a place, but as the gathered people of God in worship. It is a most wonderful thing to be in the house of God when praise overflows into a powerful sense of the presence and anointing of God. Some people think they can work this up emotionally. But this is beyond emotion. It is where all the people --surrounded by the angels of God -- are one in giving praise and glorifying God as it is now and will be forever in heaven (Revelation 4-5; 7:10, 12; 15:3-5). Yes! "Unto Him be glory in the church, both now and evermore." We want the Shekinah glory of God in our midst and know that this comes as we give him glory through our worship and praise. Meditate on Colossians 1:27b: "Christ in (en) you, the hope of glory." The context is the Gentile church, the pronoun "you" is plural -- as if Paul were a Southerner saying, "Christ in y'all (you-all), the hope of glory." However you take the preposition en, it is clear that Christ and his Church are together to give glory to God -- the Redeemer and the Redeemed, the Bridegroom and the Bride. How long, you wonder? The answer is found in the third element of this doxology -- "forever and ever." Amen! May its truth stand! Q9. (3:21) How can God receive more glory in your local congregation? How can you help this happen? Father, I am so humbled by Paul's prayer for the believers. My prayers seem so small and piddling by comparison. So self-centered or problem-centered. Please teach me in my heart to pray wonderful God-centered prayers that are not limited by the degree of my faith, but only by your own limitless power. Lord, I've been studying some of the great prayers of the Bible. Please don't let my study be wasted in mere intellectual understanding. Build my spirit so that in the future I will pray great prayers to you with all my heart. In Jesus' name, I pray. Amen. This completes the Great Prayers of the Bible study. Would you please evaluate this Bible study by filling out a brief survey? Thank you. I have outlined Paul's prayers in Ephesians with a certain logic and symmetry. But my way is only one way of looking at them. As Markus Barth (Ephesians 1-3 (Anchor Bible 34; Doubleday, 1974, p. 368) comments: "Elements typical of the language of prayer defy a strictly logical analysis. At this point Paul's thinking follows the form of devotion and meditation rather than that of deduction, induction, careful subordination or coordination." Pauō, "to cease doing something, stop oneself, cease" (BDAG 790), is in the present tense, suggesting continued action. Francis Foulkes, Ephesians (Tyndale New Testament Commentaries; Eerdmans, second edition, 1989), p. 68. Philo (25 BC-45 AD); de Josepho 147. Barth's list of antecedents doesn't yield "eyes of the heart" prior to Paul (Barth, p. 149, fn. 25). Words and Music by Paul Baloche, ©1997, Integrity's Hosanna! Music. "Inheritance" is klēronomia, the common word for "inheritance," then "possession, property." Here it is used of our possession of "transcendent salvation," as the inheritance of God's children (BDAG 547-548). The phrase "of our Lord Jesus Christ" in the KJV, parallel to 1:17, isn't found in the earliest manuscripts and is omitted in modern translations. F.F. Bruce, The Epistles to the Colossians, to Philemon, and to the Ephesians (New International Commentary on the New Testament; Eerdmans, 1984), p. 324-325. Patria can refer to "people linked over a relatively long period of time by line of descent to a common progenitor, family, clan, relationship," or specifically in this passage, "family" (BDAG 788). Literal rendering in The New Greek-English Interlinear New Testament, by Robert K. Brown and Philip W. Comfort. So Bruce, pp. 326-327; Foulkes, p. 111; Barth, pp. 369-370. Joseph Armitage Robinson, St. Paul's Epistle to the Ephesians (London, 1964), cited by Foulkes, p. 114. Barth, in "Comment VI. Head, Body, and Fullness," pp. 200-210. Barth draws on the research of G. Münderlein, "Die Erwählung durch das Pleroma --Bemerkungen zu Kol. 1, 19," New Testament Studies 8 (1962), 264-276. Barth also comments on the meaning of plērōma in pp. 367, 374. Patrick T. O'Brien, "Benediction, Blessing, Doxology, Thanksgiving," Dictionary of Paul and His Letters [DPL] (InterVarsity Press, 1993), p. 69. "Unto Him Be Glory in the Church," words and music by Hugh Mitchell, © 1958, Singspiration Music. In Scripture in Song, Book One: Songs of Praise (Scripture in Song, 1979), #136. Sometimes, however, the senses seem to merge together. The first sense is: "May God be glorified by means of the church. May God be glorified by means of Christ Jesus," understanding en in the instrumental sense, "with, by means of." H.E. Dana and Julius R. Mantey, A Manual Grammar of the Greek New Testament (Macmillan, 1927, 1955), �112. BDAG 326-330. Barth (p. 376) is startled by the order -- the church mentioned before Christ. He observes: "Paul mentions the church first because he starts from the actual locus of God's praise. Then he adds a reference to the Messiah Jesus to designate the basis of that praise."